For the first time, I´m not posting a rarity but a hit record. Abidik Gubidik Twist is the Turkish Twist hit record and was also featured in two movies. However, I guess outside of Turkey few people will have heard these songs. While Turkish Psych has fans worldwide, Turkish Twist is still only known to Turks. Abidik Gubidk Twist was re-released in 2011, though buried in a 5 CD-Box of Turkish movie songs. As far as I could see Göz Göz Değdi Bana has never been commercially re-released. 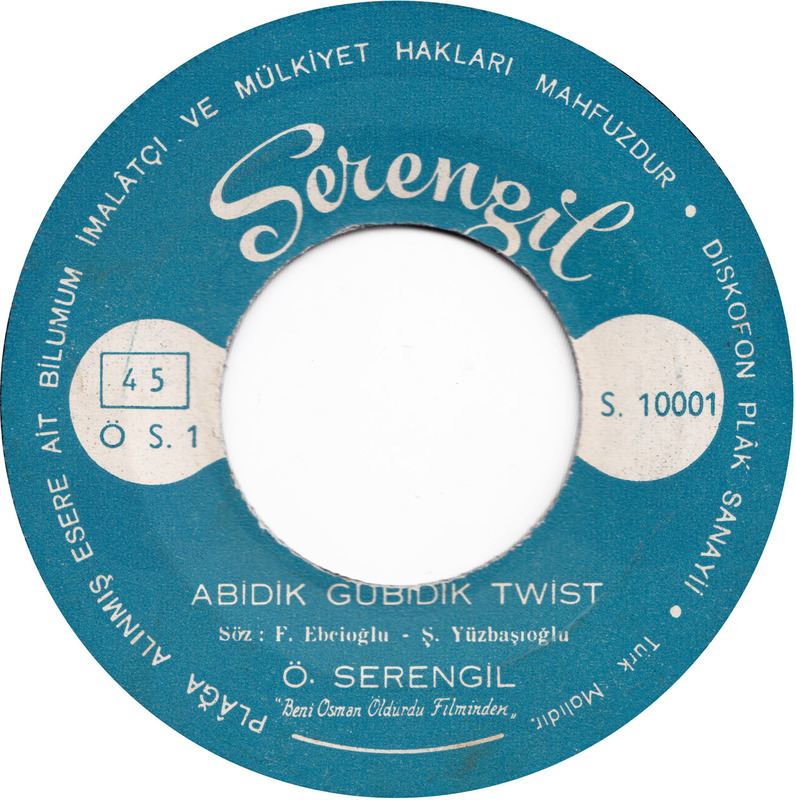 Abidik Gubidik Twist (“Nonsense Twist”) first appeared in the opening scene of the 1963 film Beni Osman Öldürdü. Following its success, the song again appeared in the opening sequence of Abidik Gubidik. Öztürk Serengil was a comedian who starred in close to 300 movies. He died in 1999 at the age of 69. His daughter Seren Serengil is also a pop singer. 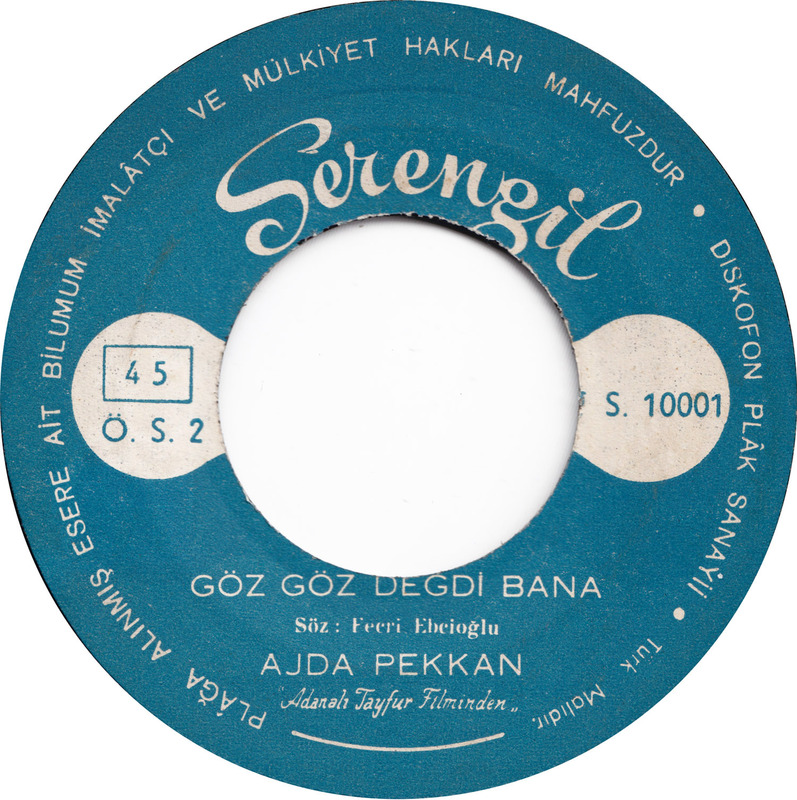 This record came out through Öztürk´s own short-lived Serengil record label. A great first release that features two Turkish Twist hits. Abidik Gubidik Twist even has a nice guitar solo. Ajda Pekkan was only 18 when she sang Göz Göz Değdi Bana in her first film “Adanalı Tayfur”. Today Ajda Pekkan is the Turkish Superstar. Altogether she has starred in 47 films. Andreas You’re mighty!! Thanks for the good twists from Turkey! Greetings From Hungary! With Respect: Mr.jukebox. Thanks! Glad you enjoy it!